The shampoo is recommended for all hair types and everyday use. I sincerely recommend it because we are convinced of the good effect of its use. The good effect is in the composition of the product. 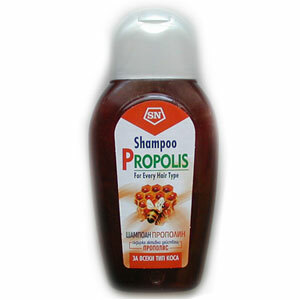 It contains high quality propolis. There is no colorants, flavoring agents, preservatives. Propolis as a natural antibacterial substance plant strengthens hair, fills the cracks of the roots and thus strengthens them. The reinforcing effect is further enhanced by antimicrobial and antifungal effects of the product. We sincerely recommend this product and offer it to your attention, and only because we are convinced of its emphatic effect in dandruff, lichen scalp with different causes, brittle and weak hair, alopecia with local genesis and others. Mild and non-irritating can be used in children after 3 years of age.